The idea of utilizing computer aided design and fabrication to create a design that is more materially efficient, while important, is nothing new. This elective course set off on this relatively familiar path in an attempt to more efficiently represent their ideas with a given material. While several projects were produced through the course of the semester, one in particular questioned the concept of efficiency in an atypical way. This project chose to incorporate the ideas of material efficiency but also to draw in the idea of spatial efficiency as well. Designed in part for the annual AIAS 2007 Corrugated Cardboard Chair Design Competition, this object was intended to contain an entire room of furniture when “packed.” Upon unpacking the chair (which itself could be reconfigured into three different seating orientations) contains, two side tables, two bookshelves, and a footstool, the accoutrements for what would be a relatively well furnished college dorm room. All of the furniture and the connections were explicitly constructed of corrugated cardboard and required no tools or additional means of connection. 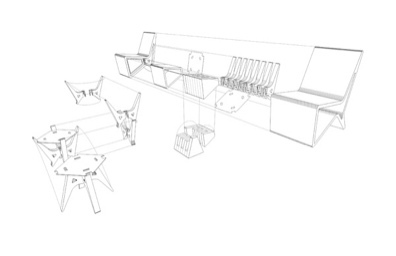 While not as materially efficient as the project set out to be, this reconceptualized idea of efficiency proved to be an area of study that would push the students to constantly critique themselves throughout their design processes.